The front cover of the Log of the Snark with beautiful gold leaf depiction of the Snark at sail. The Foundation has recently acquired a lovely new piece for the California State Library’s California History Section. This acquisition is a signed first edition of Charmian K. London’s The Log of the Snark, which was published in October of 1915 by The MacMillan Company. Charmian K. London was the wife of famous California author Jack London. During their marriage, the two embarked on many wild adventures together. One of these wild adventures was a sailing voyage on the Londons’ newly commissioned boat the Snark from San Francisco, California, to the Cannibal Islands (Solomon Islands) in the South Seas. It was a journey that lasted over two years and not only brought the accompanying group of friends many trials and tribulations but also many wonderful experiences and memories. Well, here’s the old “log,” between covers at last! It isn’t known who Jessie is, but they must have been close to Mrs.London to receive such a special gift. Our special acquisition also comes with an original photograph that is pasted into the inside front cover opposite the signature page. This picture capturing Jack, Charmian, and their newly adopted dog was taken in Pendruffyn, Guadalcanal, sometime during their stay there. The adopted dog, Peggy, ended up accompanying them through the rest of their voyage. 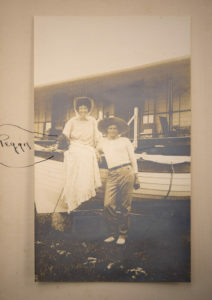 The book is illustrated with various other pictures taken by both Jack and Charmian while aboard the Snark and while discovering the many different islands they visited. Images within the book show insights of the trip, ranging from the Snark being built in the San Francisco Bay, to its last moments in the Londons’ hands when it was careened for repairs and left for salvage at the end of its journey in Meringue. wonderful pages of my life. For after all, it was Jack’s idea to embark on this journey, and his disdain for letter writing that inspired the diligent journaling of Charmian that we now know as The Log of the Snark. and after Jack by our Sonoma poet Laureate, Iris Jamal Dunkle ‘What Comes from Joy: Charmian Kittredge London, more than Jack’s Wife’ At the ‘Sitting Room’ in Penngrove today we heard a remarkable preview. Ingrid. Thank You so much for that information! We will have to pick ourselves up a copy!